Tansy (Tanacetum vulgare, Linn.) is a perennial herb of the Compositae, native of Europe, whence it has spread with civilization as a weed almost all over the world. From the very persistent underground parts annual, usually unbranched stems, sometimes 3 feet tall, are produced in more or less abundance. They bear much-divided, oval, oblong leaves and numerous small, yellow flower-heads in usually crowded corymbs. The small, nearly conical seeds have five gray ribs and retain their germinability for about two years. 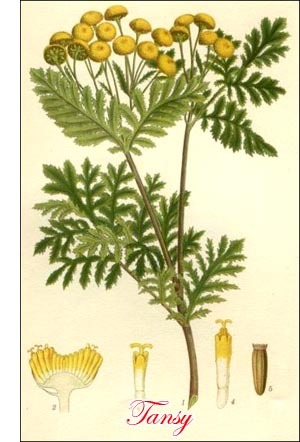 Tansy is easily propagated by division of the clumps or by seed sown in a hotbed for the transplanting of seedlings. It does well in any moderately fertile garden soil, but why anyone should grow it except for ornament, either in the garden or as an inedible garnish, is more than I can understand. While its odor is not exactly repulsive, its acrid, bitter taste is such that a nibble, certainly a single leaf, would last most people a lifetime. Yet some people use the herb to flavor puddings, omelettes, salads, stews and other culinary dishes. Surely a peculiar order of gustatory preference! It is said that donkeys will eat thistles, but I have never known them to eat tansy, and I am free to confess that I rather admire their preference for the thistles.